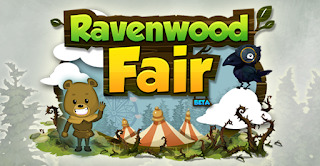 Did you guys did go through the tutorials for Ravenwood Fair before you started playing? It wasn't that hard to get started. I'm only halfway through listening to this, but it's so fascinating that I have to leave a comment; I'm really glad y'all are doing this! * In the discussion of Ravenwood Fair, one or both of you talked about meaningless clicking. I'd be curious to hear your thoughts as to why you interpret clicks that chop down trees in Ravenwood Fair as meaningless while you don't (I assume, I could be wrong!) interpret clicks that kill demons in Doom as meaningless. And that's not a rhetorical question, I really am curious, I think there's something to be dug out of that question. * In the bit that I just finished listening two before I walked in the door, Scott hypothesized that Facebook games want to get you clicking as soon as possible because they want you to use up energy and hence have a desire to spend money. There's probably something to that, but there's something else really important going on there (especially in the first play session): when working on Facebook games, you have to be acutely aware that players don't owe you any of their time/attention at all. A player who has bought a game already has invested something in that game, so while they might grumble about a bad tutorial, say, it won't (generally!) cause them to give up that game and go do somewhere else. Whereas somebody who is coming to a Facebook game hasn't invested anything more than clicking a link, and can leave just as easily. So you can put all the care you want into the later stages of the game, but if you design your tutorial (heck, even your initial loading screen) such that only 1/3 of players make it all the way through instead of 2/3 of players, you may actually have lost half the money you'll ever make on the game right there, in the form of potential lost earnings for those players. (And their friends - if you want, I can write down an equation about how friends contribute to FB games making money.) Which, actually, means that in their own way FB games have to be more respectful of players' time than other forms of games. Okay, now I've listened to the whole thing. It was very interesting at the end hearing you talk about how FB game players don't have the sort of game literacy that you expect game players to have while remembering you two complaining earlier on that you found the Ravenwood Fair interface confusing, so I was really glad that you immediately dove into exploring that yourselves. Great insights and suggestions as always, David. The more I think about Facebook games, the more I question my own beliefs about the basic aspects of video game design. It's hard to explain, but my mind has been effectively "colonized" by what has been historically considered normal: games are "products" not "services," they have specific beginning and ends, they are predisposed to fostering skills like dexterity/tactical thinking, etc. I still have reservations about them, but I can't shake the feeling that I would have a much different opinion had I not come of age (physically and intellectually) in the era of pre-Internet games. Strangely, I haven't been this excited about video games for some time. Not because I like the games or even the philosophy behind them, but because I'm unexpectedly finding my assumptions challenged. I went through the tutorials and, in hindsight, I suppose it might not have been as bad as we made it out to be. Even so, I think the rapid introduction of a bunch of different activities gave me the idea that things were much more complicated than they turned out to be. Even though most actions lead back to one of the few units of currency, they're initially made to seem varied. It also doesn't help that the interface is extremely cluttered, even my Facebook standards. That was the blog post I had read, thanks for posting it! I think it explains a lot about Ravenwood fair in general, as he essentially admits that he tried to distill the aspects of the most popular existing Facebook games and implement them in their most profitable form instead of trying to create something new. I'd be interested in seeing a more original Romero-designed social game. I second the great insight comment. To answer your first question re: clicking, in Doom at least I get the impression there is skill involved in executing my clicks. Enemies may move or fire back, and my ammo may dwindle, making the act of clicking significant. The cutting down trees bit, besides requiring no skill, also strikes me as artificial. I think you are correct in pointing out its "artificiality" may be no different from that of other games. So I think its actually the energy meter that makes these issues more glaring to me. That is, each action I make has a numerical in-game value in the form of energy. Chopping down a three, for example, takes 4 units of energy, and then I have to stop playing. When I look at the forrest, and all the trees I'll have to chop down, I am struck by the knowledge that what is potentially fun (building a carnival) has little to do with actually chopping trees, and that each time I do chop a tree, I have less energy to spend on the ostensibly fun portion. I would say this is the equivalent of the Sims charging you energy for your Sim to go to the bathroom (which it does not). This is a perceptual problem though, I admit. Mechanically, EA could force sims to pay for toilet use, but reward players with two extra energy, making up for this lost time. Regardless, the impression that the designers are forcing value onto what I consider a valueless act would still rub me the wrong way. Also, thanks for the suggestions, I'll be checking those out soon. For what it's worth, I actually enjoy cutting down trees in Ravenwood Fair. It's similar to Minecraft in that respect - sometimes, I'm in a creative mood, and want to shape my world, but sometimes I just like going down to my mine and digging away. And, of course, there are good sides of FB games that raise similar questions - e.g. there's a norm of a certain kind of expressivity (in particular in how you design your farm / house / whatever), and now I'm starting to wonder whether I'd like that to be similar common in console games.